We are multidimensional people, a “community of selves” (Glen Ochre). These selves are facets of us that at times are in harmony and other time in conflict. It does not matter, they are all valid and a deep part of us, even the ones that constantly create havoc are valid. It is possible that their behaviour is no longer needed, but, for some reason it continues to show itself. It takes a lot of time compassion and patients to allow the voice of the conflictual one to be still. 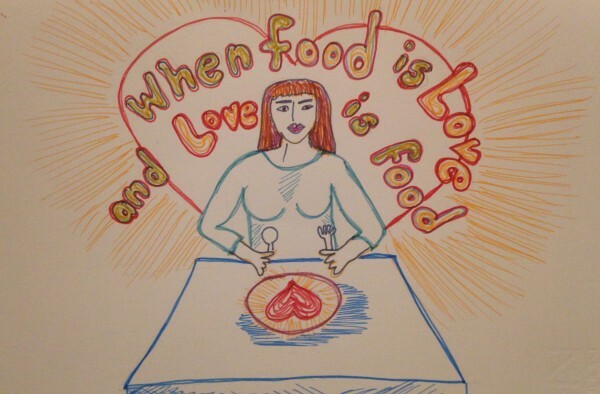 In this workshop “When food is love and love is food”, we look at the voices that want to eat in a way that creates havoc and sends all the selves into disarray. You could be the CEO of the successful company, a fabulous mother, run you own business, loved and admired by friends and community, an inspirational teacher, a brilliant and successful therapist in high demand. At the same time in your brilliance you could also be a compulsive eater, food addict, bulimic, obese, anorexia or a binge eater or some of all. We are plagued by these voices that at times isolate and diminish us, that lead us down a dark hole of remoteness, deep sadness and self loathing. I am well aware these are labels and labels are not always good, but for me they help me to identify a particular behaviour, not the person themselves or myself, I have lived with the voice of a compulsive over eater, food addict, binge eater, for nearly as long as I have been alive and that is a long time. Through much therapy, face to face and online, self-help programs, lots of research, every book you can imagine, some brilliant some not so good and a lots of personal work and deep souls searching and sharing my story with others who have similare stories, I have come to a place where I have just about leant to accept myself as I am. I understand, how it began and why. I understand that for very good reasons food became my best friend. Easy to access, full of feel good endorphins, just a hand reach away. I can accept that I have a wardrobe full of clothes that don’t all fit me, that did fit me, that sometimes fit, that may never fit me again. I have accepted that eating is a metaphor, for how I am feeling and what I am needing. I have learnt that I am not the food or the over eater. I have nearly accepted my body shape, particularly my belly with all the social implication that it represents. Mostly I have learnt that many like me, whether we over eat or under eat, it is about love. Food is Love and Love is Food, it’s a simple as that . . . but not so simple. For most of us we were simply not loved properly, not enough hugs and cuddles. We were neglected and abused, we were invisible, lonely and misunderstood. Or your reason could be different, but I am pretty sure that love is the key. Journey with me softly as we embark together on this very delicate subject, sharing our stories, through dance, movement, spoken and written word, drawing and ritual. welcome you to a safe space of no more than 8 women.